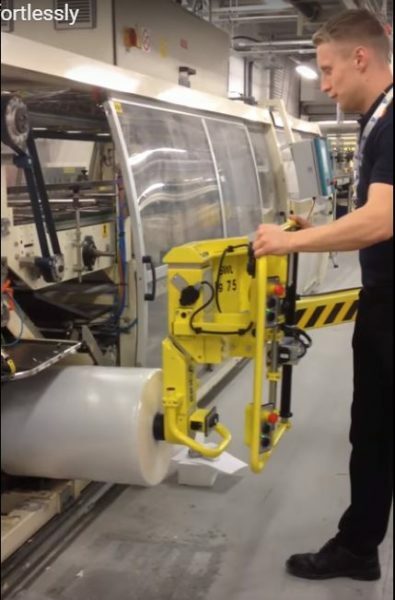 Scaglia Indeva were contacted by Unilever to help with a health and safety issue when loading reels onto a shrink-wrapping machine; they were using a mechanical trolley based solution and the operators were having trouble taking reels of plastic film from the pallet at 2 high and core vertical rotating them to core horizontal for loading onto the shrink-wrapping machine. Aligning the trolley/reel core to the winding shaft was also an issue due to the limited movement available from this solution making it slow and hard to use. The isle was narrow with limited positions to place the INDEVA® machine due to fork truck traffic and the overhead conveyor ran across the only position for the manipulator. All the information was fed back to our design team who were working on a new solution we had designed for the automotive industry to remove a spare wheel and change a battery. This solution implied a manipulator of the Liftronic® Series , Linear version, which is designed to work in confined spaces and low overhead areas. The Linear manipulator has all the same electronic balancing and auto weight sensing features of all the other versions of the Liftronic® Easy and the Liftronic® Pro Series, but allows the product to be extended beyond the centre of gravity for special applications like this. This is achieved by the whole arm running in rails on the front of the column. As you can see from the video footage, this system allows picking from the pallet, inclination to core horizontal and insertion onto the reel shaft in one easy operation. If you have any handling requirements you would like to discuss or seek advice on, then please do not hesitate to contact us.